We spent our birthday week in Italy! This was a pleasant and unexpected surprise. When we were first planning the European portion of our Round the World Trip, Italy wasn’t on our radar because we thought it would be too expensive for our long-term travel budget. The original plan was to head to Eastern Europe as quickly as possible to the more affordable countries that would allow us to stretch our dollars further on our nine months of travelling the world. But, we made plans to meet my friend from Germany in Croatia near the end of May, meaning we had a spare week (our birthday week!) between Morocco and Croatia. We could have gone into Spain, but having already spent ten weeks in Spanish-speaking countries, we were ready for something new. And, we were really missing delicious food. So, as cheap-ish flight would work out, we flew from Marrakesh, Morocco to Naples, Italy. Naples is a centrally located, seaside city in Southern Italy, and way more wallet-friendly than cities like Milan or Venice. When I asked my friend about prices in Naples, her response was: “Like, the cheapest in Italy” — which was music to my ears. It IS possible to do Italy on a budget. We spent a week in Italy exploring Naples and Rome. 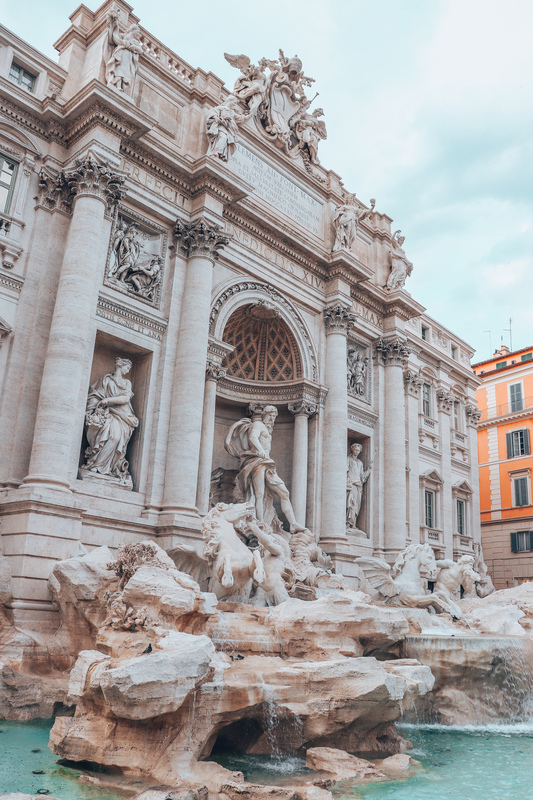 But if you factor in transportation (arrival and departure times), and our slower-paced style of travel, our visit to Naples and Rome can easily be condensed into a five day itinerary. 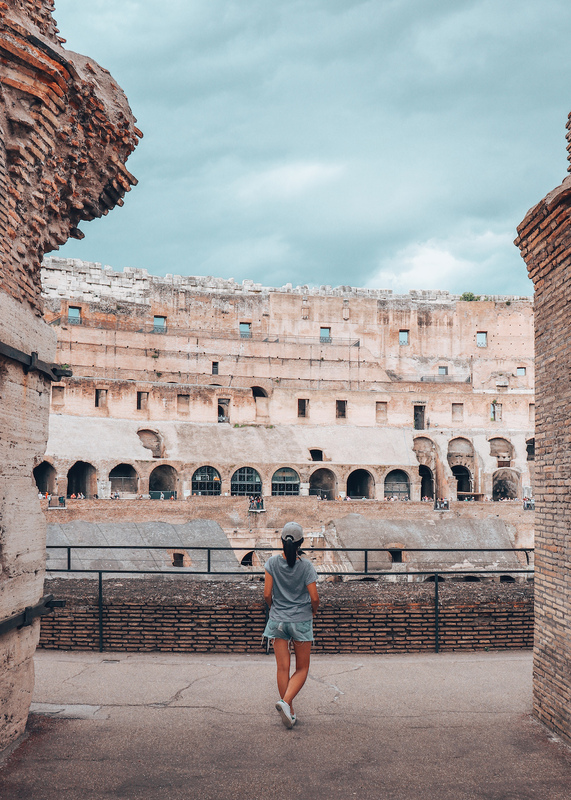 Here’s a quick summary of our itinerary, keep reading for more details, recommendations and travel tips on how to see Naples and Rome on a budget. Our budget breakdown is at the very end of this post. Day 4: Roman Ruins: Colosseum, Roman Forum, Spanish Steps, Trevi Fountain, Pantheon. Naples is an unpretentious, graffiti-filled town — best known to me as the birthplace of pizza. 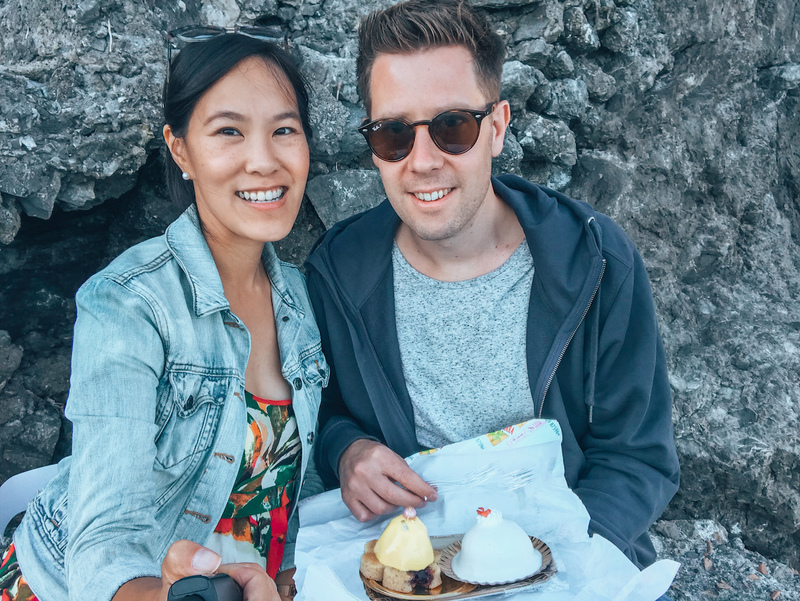 In fact, before our trip, we watched on the first episode of Ugly Delicious by David Chang on Netflix, which got us even more excited for experiencing pizza in Italy. Needless to say, our main priority in Naples was to eat pizza — but also take advantage of Naples’ central location to take daytrips to Pompeii and the Amalfi Coast, and then eventually on to Rome. 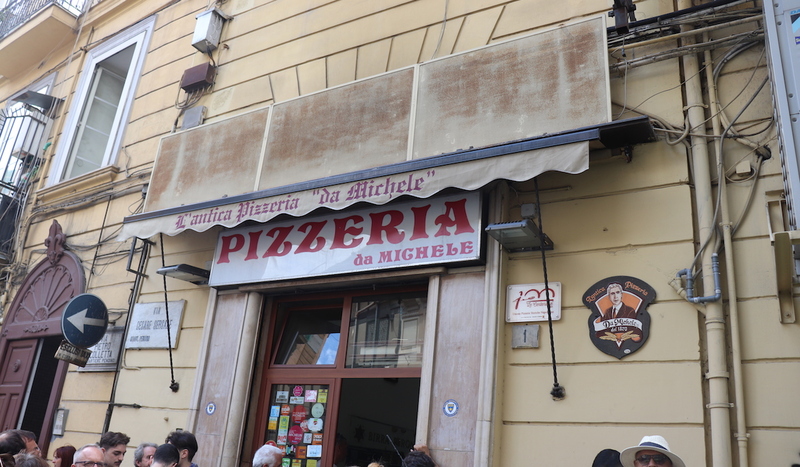 We lined up for two-hours at Pizzeria da Michele, the world’s oldest pizzeria, and also the site of the pizza scene in Eat Pray Love with Julia Roberts. There’s only two simple pizzas on the menu: marinara (tomato sauce only) or margherita (tomato sauce with cheese and basil). Despite being such a hotspot, the menu prices at Pizzeria da Michele have remained beyond reasonable at €4.50 for an entire pizza. We also went to 50 Kalo pizzeria — which is classified as “$$-$$$” on TripAdvisor, but even then, there were many options under €10 per pizza, and a single pizza can easily be shared between two people. When we first did our Italy research, we looked into staying on the Amalfi Coast a coastal region which borders the Tyrrhenian Sea. But this vacation hotspot was way too expensive for our budget (the cheapest rooms were easily €100/night, restaurants are all catered towards vacationers) so we decided to daytrip from Naples instead. Positano is a seaside, hilly walking town. This was one of the most beautiful towns I have ever seen. It’s an upscale family vacation, tourism town. However, it doesn’t cost the budget traveller anything to enjoy the beautiful views, or to lay on the beach – yay! 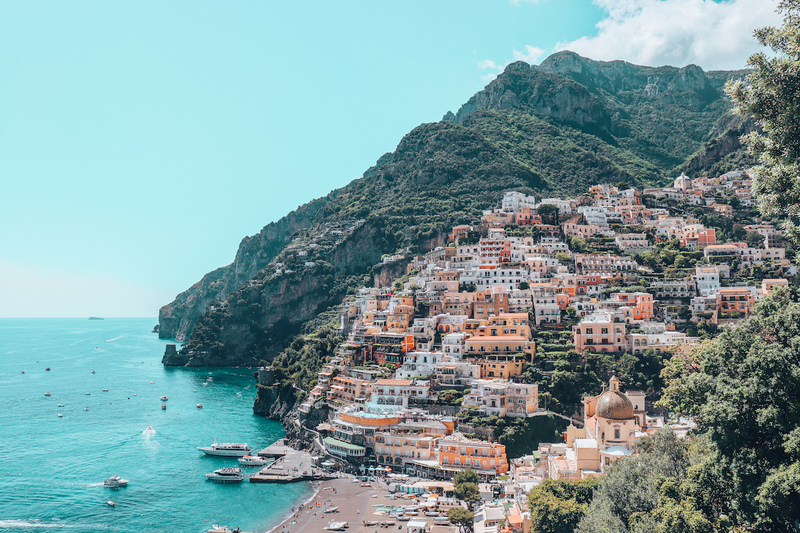 There didn’t seem to be direct public transport from Naples to the Amalfi Coast, so we first made our way by train to Sorrento for €4, and, from there, caught the public bus to Positano…. for €1.90! That same bus also goes all the way to Amalfi (the city) — so you can take your pick on what city you want to get off at, or do both in a day! Bussing from Sorrento to anywhere on the Amalfi Coast is a much more affordable option than taking a boat, which begins at €15 per person, or the hop-on-hop-off tourist bus which is €20. Lemon-themed products are everywhere in the city; for example: lemoncello, lemon candy, lemon granita, and, lemon gelato. Some stores will also sample lemon candies for free so you can try before you buy. 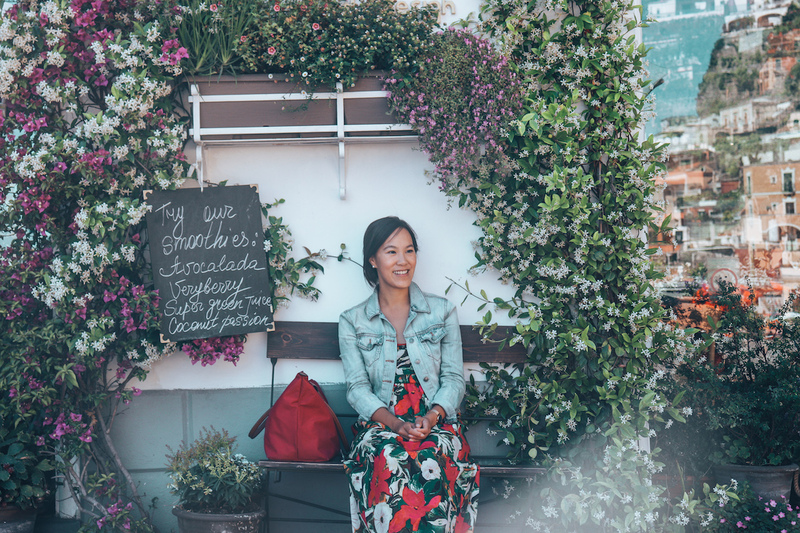 Unfortunately, when eating out, you can’t get away from overpriced restaurants — the only money-saving suggestion I have is to not dine at the beachfront, as that’s where the most expensive restaurants are located. Pastries are relatively cheap — around €3.50. The cafe we went to charged extra per item for eating there, so we ordered our cakes to-go, and ate by the water instead — an even better view, in my opinion. A 40 minute train ride away from Naples is the town of Pompeii, best known for being the town buried by the Mount Vesuvius eruption of 78AD. The ash and lava covered the town, preserving it for centuries until it was rediscovered and excavated. In fact, Pompeii is still an active archeological site; experts estimate that only two-thirds of the original has been uncovered. It amazed me that Pompeii, in 70AD was so developed. There were houses, bars, restaurants, theatres, public bathhouses, running water, and brothels. 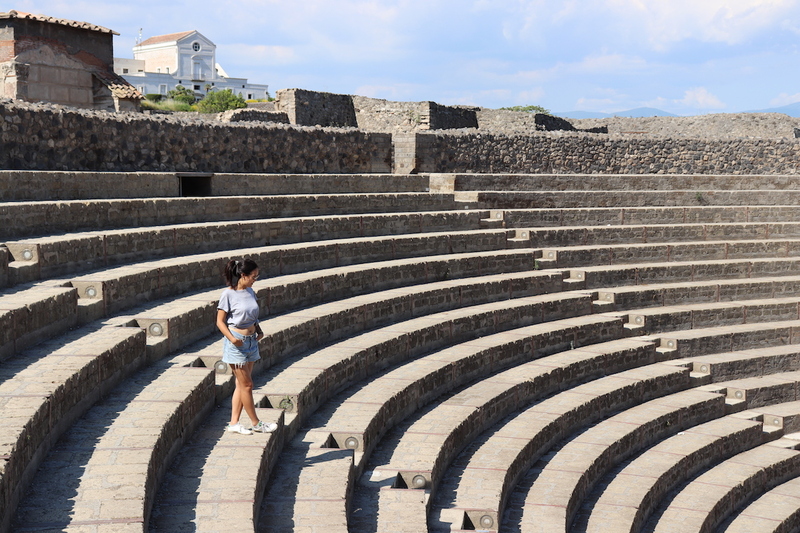 In the present day, a visit to the Pompeii archeological site means you get to walk to the preserved buildings and roads that once made up Pompeii. Admission is €15 per person. The night before visiting, we listened to a free podcast about Pompeii on Stuff You Should Know to get an introduction to Pompeii. During our site visit, we used Rick Steve’s free walking tour which completely enriched our experience and enjoyment of the visit — no need to pay for an audioguide! We spent about two hours at the site. On our way back to the train station, we stopped for €2,50 gelato at Emilia Cremeria. 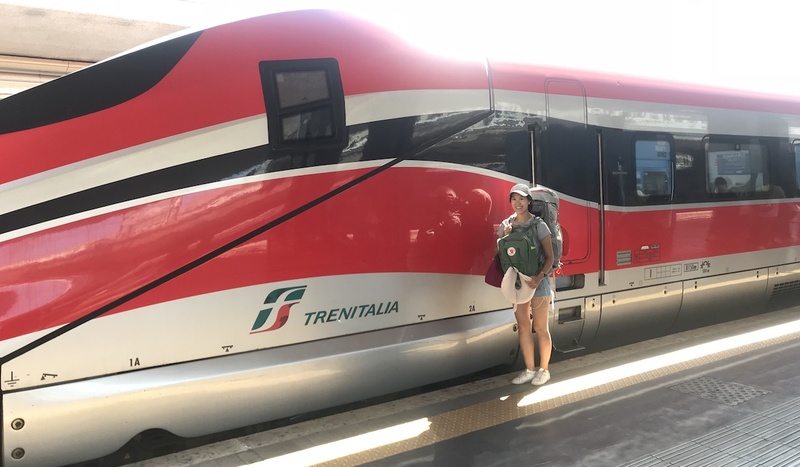 We booked a train ticket online from Trenitalia for €25 per person — you pay for, and book both your train time and seat online. Trains seem to depart regularly. The train reached speeds up to 300km/hour— it only takes one hour to get from Naples to Rome! Pricing doesn’t seem to be fixed but we were told it’s best to book sooner rather than later, for the best selection of tickets and lowest prices. 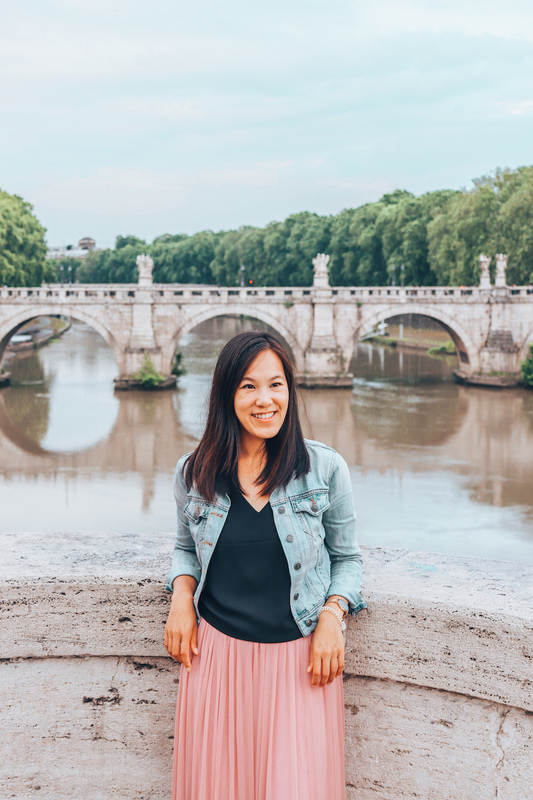 With two days in Rome, we split our time between the two days to check out attractions on either side of the Tevere River. I found the metro system in Rome super easy to navigate. There’s only two lines: A or B, and all the main tourist sites are concentrated within a few stops of each other. Metro tickets are €1.50, and valid for transfers up to 100 minutes. If you’re like us and love exploring a city on foot, my recommendation is to get off at the Colloso stop (Line B) and make your way to the sights from there. We took the metro once into town and walked everywhere from there. Colosseum (€12) — I honestly thought paying to go inside the Collesium was overrated, the inside is no more impressive than the outside. But I guess this is one of those things you must do when you’re in Rome. Once you get inside, you’ve seen it all — walking around is just a formality. Roman Forum — with your Collesium admission, you also get entrance to the Roman Forum, where you can walk through Roman ruins. Pantheon (free) — walk in and admire the dome, fresco, and art. Spanish Steps (free) — walk to the top for views of the square. Trevi Fountain (free) — toss in coins (behind your shoulder) and make a wish! Similar to our visit to Pompeii in Naples, we used Rick Steve’s FREE Guides to Europe for all our information on the sights instead of hiring a guide or renting an audioguide. For our final day in Rome (and Italy!) 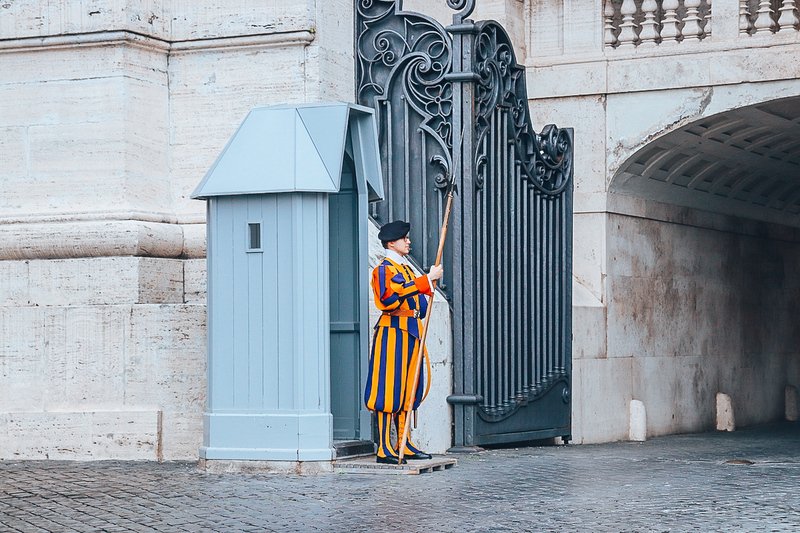 we explored the other side of the river — beginning with Vatican City. We took the metro to Ottaviano station, the closest stop to the Vatican Museum. For a cheap eat before/after going into Vatican City try Sfiziarte. Salads and Paninis are only €5. For €15 you can shared a grand mixed platter between two people — an assortment of flavourful hot meats, pasta, deep fried fried veggies, and a basket of bread and chips. Nearby the Vatican museum entrance is also Old Bridge Gelateria which makes their gelato from “organic fresh milk by Roman countryside”. Cones begin at €2, and regardless of what size you get, you can still pick three flavours! The line-up to get into the Vatican was so long. Salespeople were offering “skip the line” passes for €35 per person, but we were willing to take our chances. We waited for nearly two hours to get in — we made it in just in time before the ticket cut-off time at 4pm! (Hours vary depending on time of year). Admission to the Vatican Museum is €17. 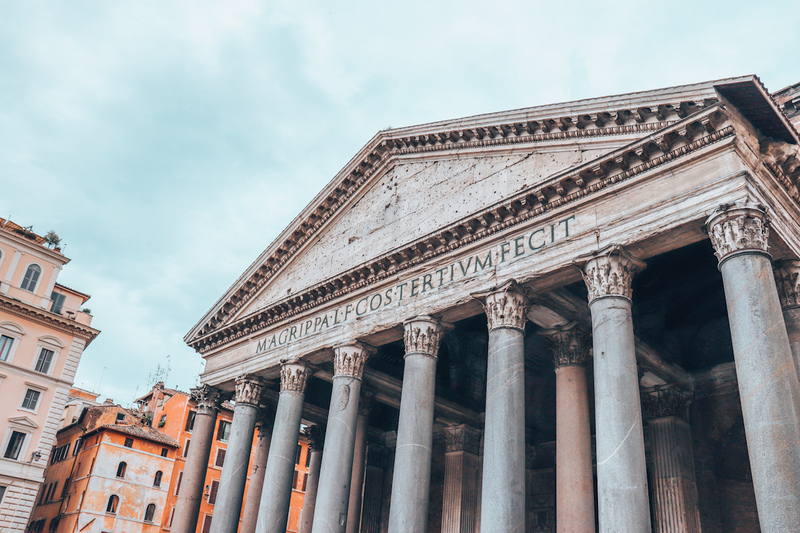 You have to go through the entire museum to get to the star of the show — the Sistine Chapel, where you can see Michaelangelo’s famous frescos and paintings that line every inch of the walls and ceilings — which took four years to paint. No photos are allowed inside the Sistine Chapel, and guards are periodically commanding “SILENCO” on a megaphone. 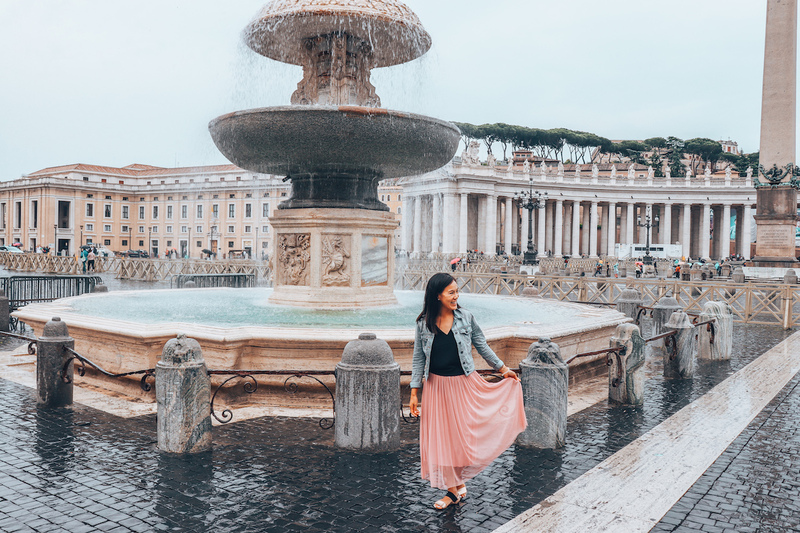 For super-budget travellers, you could time your visit to Vatican City for free admission on the last Sunday of each month, or world tourism day on September 27. However, I’ve been advised to avoid this — if it’s SO BUSY on a regular Monday, I cant even begin to imagine how crazy crowded it would be on a free day. The other highlight of Vatican City is the main square with St. Peter’s bascillica. It’s free to enter but unfortunately we didn’t get in in time — oops! But wandering through the vast Vatican square outside St. Peter’s was good enough for us. After checking out the Vatican, we made our way to the edge of the river and walked South to the Trastevere neighbourhood for our final dinner in Italy. Our spend for five days in Italy worked out to be €334/person, or €66/day. With this budget, we stayed in a private apartment in Naples, semi-private in Rome, with a private room and bathroom. We stayed outside of the main tourist areas, quickly learned to navigate the cheap metro system to get us to the main city and sights each day. We booked with Airbnb (comparable prices to the cheapest private rooms on booking.com) to stay in homes so we could do our laundry for free or have a kitchen to put breakfast in. Even on a budget, we ate well — at charcuterie hotspots, award winning pizzaerias, family-style osterias, and gelato or pastries every single day. But even then we controlled our costs by sharing meals, balancing a more expensive dinner with cheaper lunches (ie. sandwiches, pizza), ordering from the “Primi” pasta menu (rather than the meaty Secondi dishes), generously indulging in cheap but delicious Italian snacks like gelato and pastries, and buying our yogurt and banana breakfast everyday, without fail, from the grocery store. We saved by never hiring a guide, paying for “skip the line” passes, or ever taking a taxi. 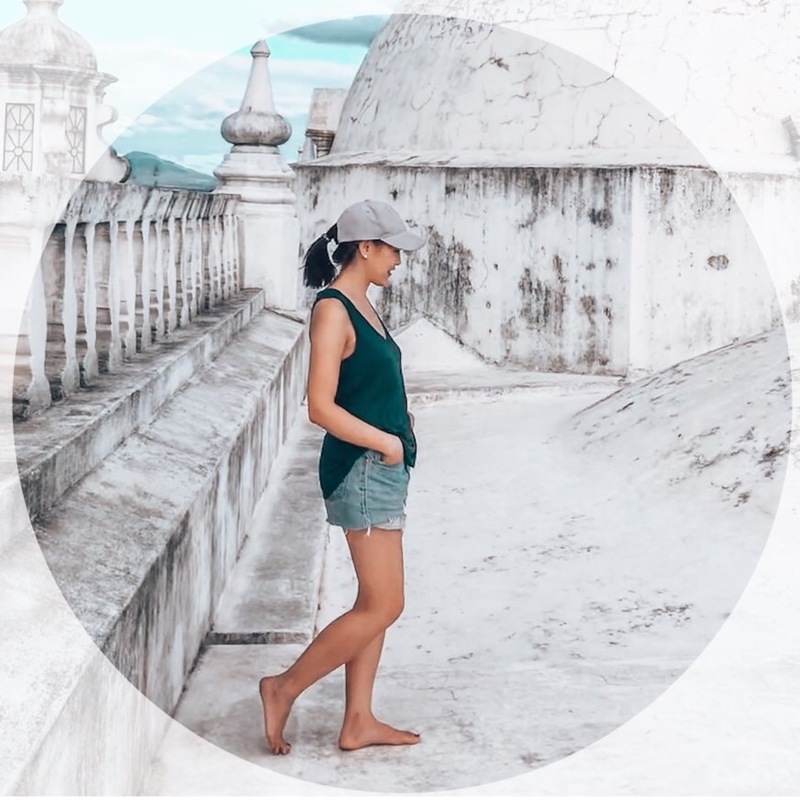 Italy was not originally on our Round the World trip itinerary — our intention was always to head to Eastern Europe as quickly as possible where it was more affordable. But, with a bit of smart spending, we were able spend a very enjoyable week in Italy!